Communicate best when it matters most! This is the definitive guide to clear, purpose-driven communication - revised and updated with new insights and powerful techniques. The classic guide to conversing in high-impact situations, "Crucial Conversations" helps you get constructive results when emotions run high and opinions vary, in the workplace and beyond. It explains how to: transform negative feelings into powerful dialog; make it safe to talk about almost anything; be persuasive, not abrasive; improve professional and personal relationships; and, impact productivity, quality, and safety in a positive way. 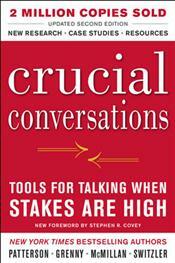 Praise for "Crucial Conversations": "Most books make promises. This one delivers. These skills have ...generated new techniques for working together in ways that enabled us to win the largest contract in our industry's history". (Dain M. Hancock, President, Lockheed Martin Aeronautics). "The quality of your life comes out of the quality of your dialogues and conversations. Here's how to instantly uplift your crucial conversations". (Mark Victor Hansen, co-creator of the number 1 "New York Times" bestselling series "Chicken Soup for the Soul").